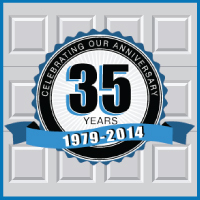 Blue Sky Builders is proud to announce our 35th anniversary! We have been building garages in Chicago and the surrounding suburbs since 1979. From our humble beginnings in our homes to our first office location in Westmont on Naperville Road, we are thankful to our customers who allowed us to do what we love and grow our business into our current Downer’s Grove location. Below we will share a little bit of history of our company and how things have changed over the last 35 years. Rick Newtoff and Scott Wendell started blue Sky Builders in 1979. Originally, we began as subcontractors who got our work from other garage builders or construction companies. Over time, we started generating some word of mouth referrals and began to do some modest advertising of our own (newspapers, fliers, Yellow Pages). We upgraded from our first office (our homes!) into our office in Westmont on Naperville Road (pictured below). In 1999, we moved to our current location in Downers Grove (424 Ogden Ave.) to increase street visibility for our business. If you are from the area you are probably familiar with the amount of traffic on Ogden! This move was just another factor in helping us grow our business. In the past 35 years, we have experienced a lot of changes in garages and what customers desire now. Garages have changed from just being shelters for cars to storage units for cars and possessions. With the rise of finished basements, a lot of people had no space for common storage, so possessions have been increasingly stored in garages. As a result, garage size preferences have completely shifted throughout our career. 35 years ago, most families had a one-car garage. Now 2 car garages are even too small for some. In fact, most prefer a 2 ½, 3, or 4-car garage with additional storage above. Technology has also changed significantly over the past 35 years. Most notably for us is the type of sidings we are now using. Due to cost and maintenance reasons, the traditional wood siding we used to use is being replaced with vinyl siding. Pictured above: Owners Rick Newtoff and Scott Wendell building a garage. What Keeps Blue Sky Builders Going Strong? Satisfying our customers is our number one goal, priority, and motivation. What we enjoy most is designing a garage with customers needs and wants in mind. Every garage is built to the owner’s specifications – not what we want to build – and with that in mind it gives us great satisfaction. Finally, we would like to send a big thank you to all of our customers!